Don't miss an episode of The Leap. One morning last year, Bryan Bashin sat down to check his email. One peculiarly short note caught his attention. “A businessman has passed away. I think you might want to talk to us,” it read. Bryan directs a nonprofit in San Francisco called the LightHouse for the Blind and Visually Impaired, so he gets a lot of email about donations. But this one felt different. It came from a group of lawyers handling the estate of a deceased businessman, Donald Sirkin. When Bryan and the LightHouse’s Director of Development, Jennifer Sachs, checked the LightHouse’s donor database, they found no record of him. Don Sirkin had never donated to the LightHouse for the Blind and Visually Impaired before, or used its services. And yet, in his will, Don Sirkin had left almost his entire estate to the LightHouse, with no explanation. In the end, the gift totaled over $125 million, more than 15 times the LightHouse’s annual budget. Bryan believes it’s the largest single gift ever given to a blindness organization. He's 60 years old, tall and almost always smiling. His eyes are cloudy; he walks with a cane. He gives off the impression of being an entirely functional, confident blind person. But this Bryan is a relatively recent incarnation, because for a long time, Bryan didn’t identify as blind at all. Bryan’s vision began to falter when he was in his teens, and gradually got worse. By his 20s, he was legally blind. Today, he says he sees the world “as if through wax paper.” He can make out some light and color, but not faces or words. Yet through his twenties and most of his thirties, Bryan squeezed by on the little vision he had, relying on magnifiers and special lamps to read what he could. He memorized the map of his daily route so as to not get lost. He only went out during daylight, to avoid the confusion of navigating in complete darkness. But as Bryan’s vision declined, these work-arounds became harder to pull off. They were time consuming and exhausting. Finally when Bryan was 38 – his vision at about 10 percent of normal -- he realized he couldn’t hide anymore. He decided to learn to be a blind person in public. A friend took Bryan to a local blindness agency that Bryan found dishearteningly shabby. Stuffing was coming out of the chairs. The air conditioners buzzed. The office hadn't been painted in decades. But he did get something out of it. He learned how to navigate with a cane. He started learning the technologies that make life vastly simpler for blind people than it was a generation ago: the smart phone, text readers and pocket recorders. And suddenly, everything got easier. For example, using text-to-speech was “vastly quicker” than trying to make out giant letters on a screen. 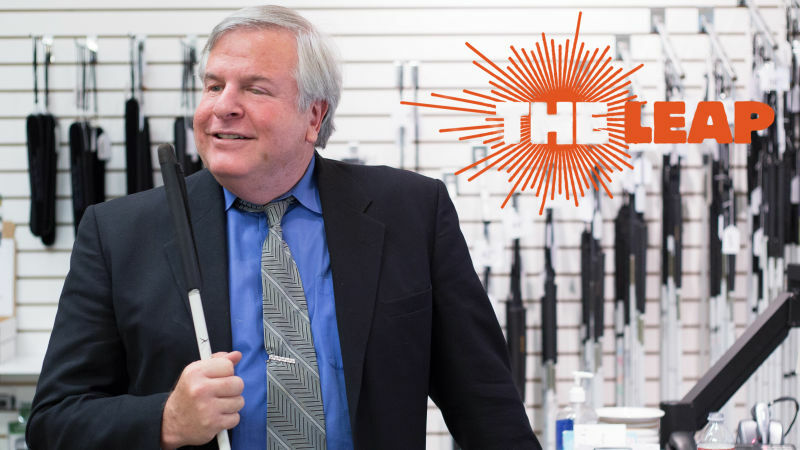 Since then, Bryan’s made it his life’s mission to help other blind people make the leap he did. He got a job at the agency with the ripped up couches. And in 2010, he became the Executive Director of the LightHouse for the Blind and Visually Impaired in San Francisco. Despite enormous technological gains that have made life vastly easier for blind people in the last decade, there are still significant obstacles to independence. The unemployment rate among working age blind people is 50 percent -- ten times the national average. Job training is expensive, and learning to live independently as a blind person takes time and resources. It’s often easier to get disability checks than to find and pay for necessary training. Through near constant fundraising, Bryan’s organization has the resources to provide basic services to their clients. But what Bryan wants is bigger than that: a change in how blindness is perceived. He wants to to encourage more blind people to come “out of the closet,” to embrace and celebrate blindness as a difference, and get the skills they need to pursue their ambitions. Now, suddenly, thanks to this mysterious businessman in Seattle, Bryan and the LightHouse are looking at a different scale of ambition. LightHouse for the Blind and Visually Impaired is just beginning its strategic planning process, to decide how to spend the Sirkin money, but Bryan has some ideas. One major project – which had begun well before the Sirkin grant – is a new headquarters in San Francisco. The building will have expanded facilities, including a dormitory where blind people can stay while they receive training in blind tech, cane navigation, and other necessary skills. There’s also the idea of a MacArthur Genius type award for blind people who do extraordinary things – say, travel around the world independently, or invent some kind of game-changing tool for blind accessibility. For now, Bryan wants to understand the man behind the donation: This mysterious Seattle businessman, Donald Sirkin, left $125 million to an organization that had never heard of him, with no explanation -- just a few legal sentences in a three page will. Last year, to try to reconstruct this man from the dead, Bryan made a trip to Seattle, where Don Sirkin had lived. He took a tape recorder and interviewed everyone he could find who had known Sirkin, including Sirkin’s ex-girlfriend, a half dozen of his colleagues and good friends. The interviews reveal a charismatic, idiosyncratic businessman. Sirkin built a hugely successful insurance company from the ground up. He was on a caloric restriction diet that consisted of large quantities of pomegranate juice and seaweed. He refused to eat in public. His ex-girlfriend Sue Tripp remembers going to a trip to New York with him. But while Sue went to see the Statue of Liberty, Sirkin stayed in the hotel and exercised for hours. Don Sirkin commanded attention. If left too long in a waiting room, he would walk around on his hands to catch the eye of the receptionist, as change and keys flew out of his pockets. He loved a big gesture, handing out hundred dollar bills to his staff after closing on a big client. The interviews also reveal a man estranged from his family. Missing from Bryan’s tapes are Don Sirkin’s children. He had two – a daughter and son. Neither of them wanted to be interviewed. The kids received relatively little from his will: $250,000 apiece, compared to the LightHouse’s $125 million. In May, Sirkin’s daughter Anna sued her father’s estate. Her complaint says that her father hit her and touched her sexually. She says this happened dozens of times. If she wins, she could get a small percentage of what would otherwise go to the LightHouse. Anna told us through her lawyer that she didn’t want to talk to us for this story. As part of the Sirkin bequest, the LightHouse inherited Sirkin’s private residence on the edge of the Puget Sound. Last year Bryan and Jennifer Sachs, the LightHouse’s Director of Development, went to see it. Jennifer recalls that the house was in disrepair. Crows had pecked away at the shingles. The roof was crumbling. And inside, it was packed with stuff: piles of old papers, paintings, plastic clocks stacked on top of each other. What Bryan wanted, of course, were clues. And pretty quickly, he found them. “As we wandered through [Sirkin's] house,” Bryan said, “we saw all these gadgets: giant light boxes, magnifiers, enormous plasma TVs in his kitchen and throughout his house.” Bryan recognized these clues because he’d used them himself, back when he was trying to hide his blindness. It appeared that Sirkin, too, had lost his sight. He kept it a secret from almost everyone he knew. Instead of getting help, or learning to use a cane, it seems he’d tried to bring his eyes back with special diets, the pomegranate juice and the caloric restriction. Sirkin’s colleagues said in his final years, he became more reclusive than ever. He holed up in his house. In his case, in a little room off the side of his kitchen. In that room, Sirkin's heart gave out on him. His body wasn't discovered for days. To Bryan Bashin, Don Sirkin is a black box, a mystery. Estranged from his family, reclusive, even to those who worked with him. A guy who made this dramatic, final gesture-- this extravagant gift-- to people whom he’d never met. What Bryan found in Sirkin’s home reminded him of his own difficulty in “coming out” as blind. Sirkin couldn’t make the leap Bryan did. Instead, he hid. But he also did something else. He left his entire inheritance to a group of people who could have helped him, but didn’t get the chance. 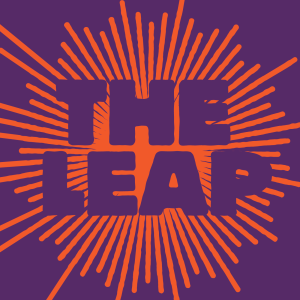 Please consider subscribing to The Leap! You can do that through iTunes or Stitcher.